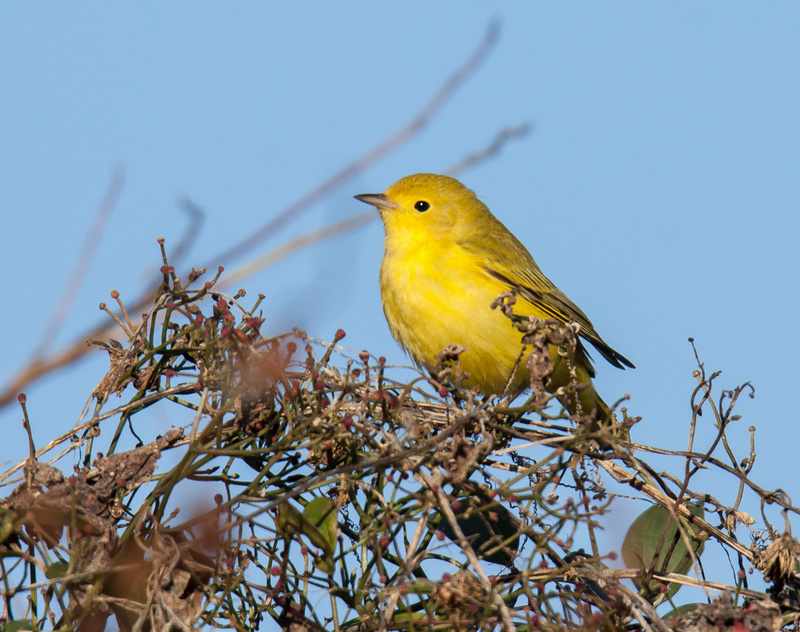 Yesterday at Occoquan Bay National Wildlife Refuge I spotted this bright yellow warbler. Amazingly, it is actually called a Yellow Warbler (Setophaga petechia). There is sometimes a mismatch between the appearance of a bird and its official name, so I have learned that common sense does not always help in identifying a subject. I was quite shocked when I first caught a glimpse of this little bird. The bright yellow on its body really stood out among the more muted tones of the fall foliage. I don’t know the normal dates for this warbler to be present, but I suspect that this is really late in the season for it to be around still. We had several inches of snow this week and nighttime temperatures have dropped below the freezing levels. Most migratory birds, I suspect, have already passed through our area on the way to warmer spots. I’m glad this little guy hung around for his photo shoot. Nice clear shot, Mike. We get nesting pairs of these down by our river – a lovely sight to see. What a lovely pure yellow and such a cute wee bird! Very pretty! It really does stand out! Great capture and a ray of sunshine, Mike. Hope the little guy makes it south! Nice! That bright yellow certainly stands out! The bright color definitely helped me to keep track of the warbler as it moved about through the vegetation.